Among the highlights of Tuscany are the numerous ‘scenic drives’ through its gorgeous countryside. However, many of these roads aren’t safe for running, due to lack of shoulder and cars going way too fast. But frown not! There’s a series of quieter, unpaved back roads that run among the vineyards and olive groves of the Tuscan countryside, called ‘Strade Bianche’ (white road), which are fantastic for running. There are hundreds of miles of these roads, so it’s hard to recommend specific routes. 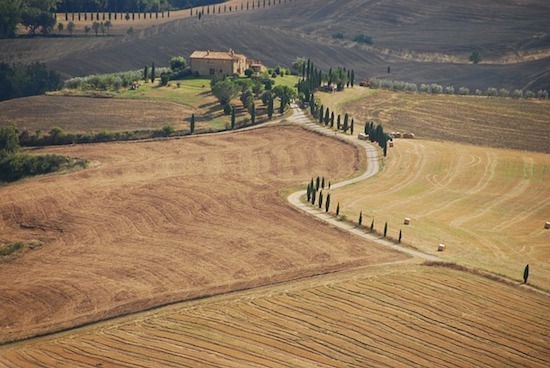 But below are a few recommendations — many thanks to our friends at Love From Tuscany. Alternatively, look for the Strade Bianche coming off many of the secondary roads through the countryside. Crete Sensi. Lovely Strade Bianche off SP 438 that runs from Siena to Asciano, and off SP 451 along the way to Chiusure, for a run through this ‘lunar landscape’ part of Tuscany.